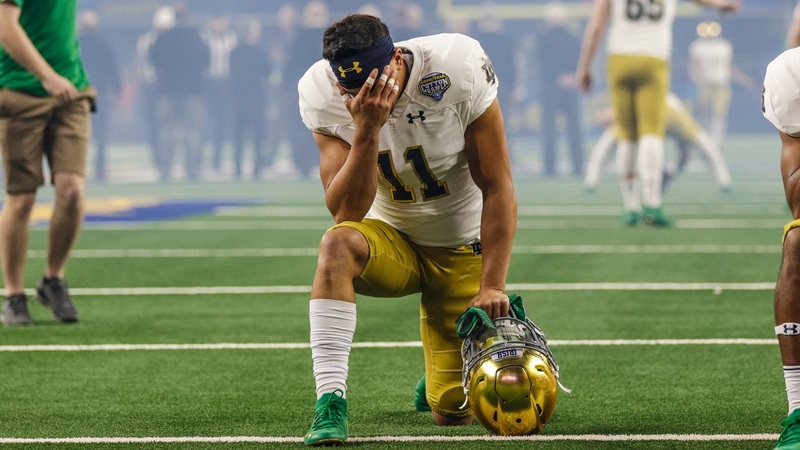 When he gained eligibility for Notre Dame, Alohi Gilman injected new life into a safety position that had been a liability for the Irish defense for the previous two years. Now the budding superstar wants to focus on his leadership position for the upcoming season. The former Navy transfer was a tremendous addition to Notre Dame’s defense, immediately filling a need at safety while providing a leadership presence in the secondary. That leadership mentality is carrying over to this season, and he’s looking to help the young safeties grow. Gilman stressed the importance of paying attention to film for inexperienced safeties. Unfortunately, Gilman has been battling an abdominal injury that’s kept him sidelined for the majority of spring ball. Gilman battled this same injury leading up to the Cotton Bowl against Clemson last season, and the Irish coaches and trainers are easing him back into his practice routine. Although he hasn’t been getting the practice reps he’s used to, he is still focused on his role with the team and hasn’t stepped back from his responsibilities as a captain. Gilman’s status for the Blue-Gold game is still uncertain, but the star safety feels he’s getting closer and closer to being full strength. Despite having limited reps in spring practice, Alohi Gilman and the rest of Notre Dame’s secondary are working towards building trust and chemistry together. Gilman also pointed out the adjustments necessary to lead a different, younger team. Gilman trailed only Te’von Coney in total tackles last year, and his three forced fumbles tied him with Jerry Tillery for the team lead. As he continues to grow, he’s focused on working toward regaining his strength and continuing to exhibit his leadership skills.